La-la la la-la. . . Sing that wordless intro within a small group of people and you’re bound to find at least one person who knows which TV show you’re referencing. My first memories of Daria were encompassed within the Golden Age of MTV, alongside programming such as its predecessor Beavis & Butthead — as well as The Real World, Road Rules and Total Request Live. 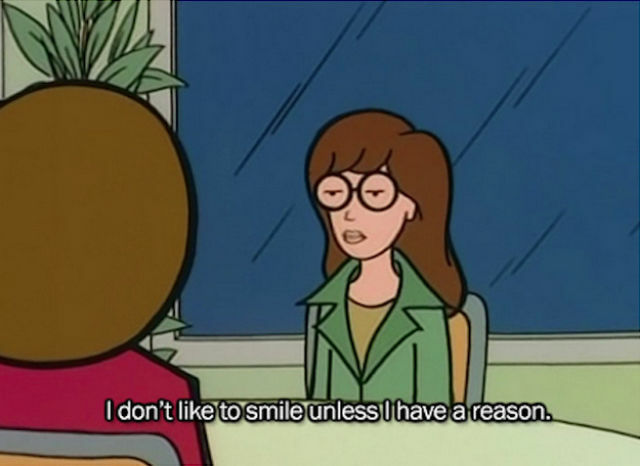 For those of us jaded, cynical high school students who could’ve cared less about popularity, Daria Morgendorffer was the animated representation we’d all been waiting for. With the resurgence of shows like Girls and Broad City, which have been lauded for their portrayals of female friendship in all its incarnations, it’s plain to see that Daria was one of the ancestors of quippy social commentary. Alongside her best friend Jane, Daria never held back when it came to telling it like it is — and her wisdom has endured, and even thrived, via the power of the Internet. In a recent article for Splitsider, Chris Kopcow asserts that now, more than ever, this show “deserves to be revisited or discovered for the first time.” Agreed. Here are just a few reminders of why Daria was so relatable. In episode 203, “Quinn the Brain”, Daria’s younger sister Quinn writes an essay that gets published in the school newspaper. As a result, she’s viewed as an intellectual by her peers and is horrified by the thought that she might lose the level of popularity she’s achieved. Daria is forced to examine her own status as a ‘brainy girl’ — while also breaking down the oppressive beauty standards of high school-slash-life. In episode 111, “Road Worrier”, Daria finds herself on a road trip to the musical festival Alternapalooza. The trip doesn’t go as smoothly for Daria as planned — her glasses break, she gets stung by a bee and the group’s mode of transportation breaks down. By the time they manage to fix the problem, they wind up missing out on the concert – but it’s not a total loss, because Daria gets the chance to spend some time bonding with her crush, Trent. Still — sometimes it’s nice not to have to go anywhere. Thanks, D, for the reminder. In episode 102, “The Invitation,” Daria is invited to Brittany’s party after helping the cheerleader in art class. After reluctantly accepting, Daria and Jane show up at the party only to quickly realize that this isn’t their scene after some guys attempt a series of lame pick-up lines. Daria’s sister Quinn, embarrassed by the fact that they’re at the same party, bribes her to leave. It’s one of the first episodes that glaringly highlights the differences between Daria and the popular kids, and it definitely isn’t the last. Her take on the prejudices so-called “outsiders” face is straight-up truth. “Gifted,” episode 208, revolved around Daria’s invitation to visit Grove Hills, a private school for academically exceptional students. 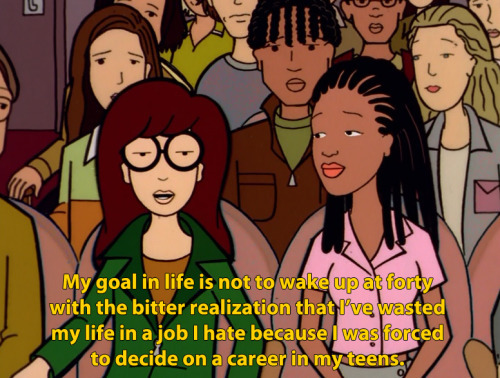 There, Daria comes to the conclusion that the ridiculously smart kids who have their whole life planned out are way too intense. She realizes she’s better off at a normal high school where she doesn’t have to have everything figured out right away — and there’s nothing wrong with that. Am I right, fellow 20-somethings? Episode 113, “The Misery Chick,” includes a scene where Daria and Quinn are showing their parents their school photos. Quinn’s is in front of a forest waterfall motif, and Daria’s, well, isn’t. Whether it’s a school photo or something else, she’s not going to allow herself to fall under the spell of what everyone else is doing just because. If she’s going to smile, it’s with darn good reason, and no one was going to tell her any differently. Besides, who ever looked good in their school pictures anyway?